Armour Plus is a special process which has been developed to create a very rigid, super-strong acrylic bath. create a very rigid, super-strong acrylic bath. Renaissance has produced the modern equivalent of the old cast iron bath but with a better surface and a warmer touch. How do we do this? LAYER ONE – Outer surface. High gloss acrylic. Solid colour won’t fade or rub off. LAYER TWO – Glass reinforced Polyester provides strength & high impact resistance. LAYER THREE – Special mix of Polyester resin & glass fibre increases torsional rigidity. LAYER FOUR – “Blue” mix of Polyester resins seal the shell & completes the lamination. 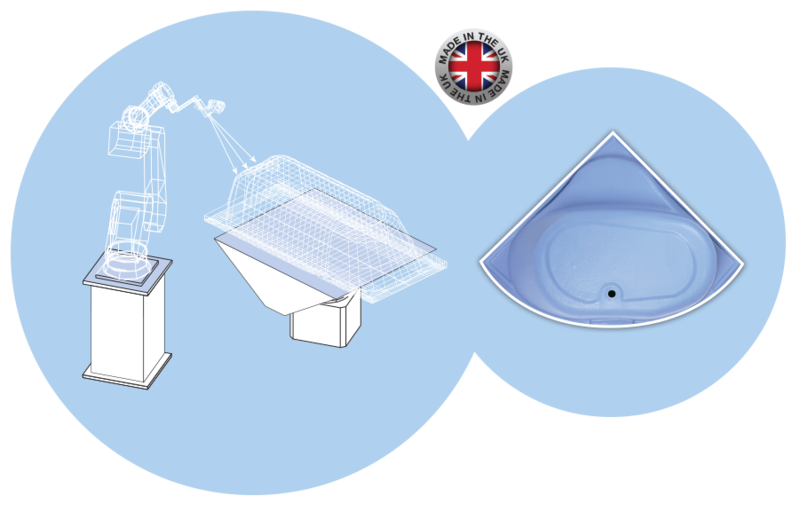 Whereas most acrylic baths are constructed in two layers, Renaissance Armour Plus baths have four layers. Each one is designed to provide extra strength exactly where it is needed. This requires manufacturing to a high degree of accuracy such as that which is provided in the motor industry by robots. So we decided to use robotics to do this exacting job for us.